Hey, friends! As Christmas gets closer, it’s the time of year when many folks really want to get creative and make things. But it’s also when most people have the least spare time to do it. 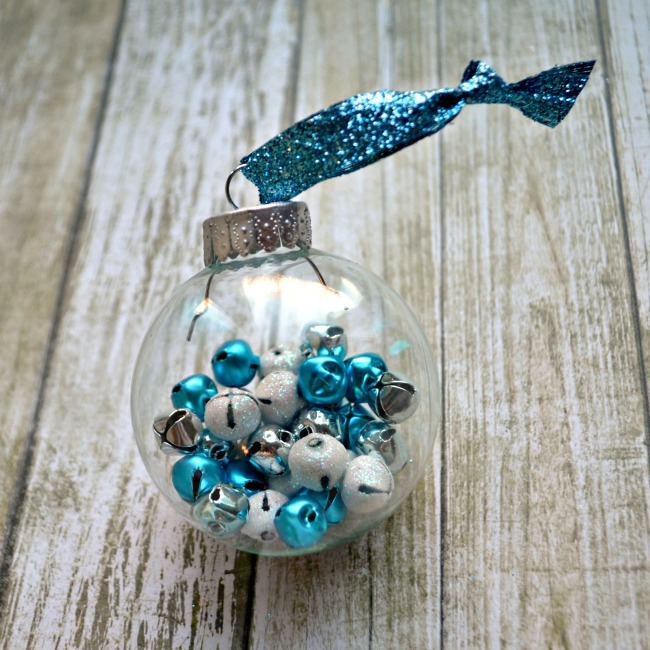 So, here is a super-quick and simple ornament project you can make that will liven up your décor in just a few minutes! Step 1: Remove the ornament’s cap and pour the jingle bells inside. I believe there were 30 in our package. Step 2: Replace the cap and tie a loop of coordinating ribbon to it. Naturally, ours sparkles since we think glitter makes everything better! Step 3: Use alphabet stickers to personalize by adding a word or name. If you have an electronic cutting machine, you can always cut out letters or designs from vinyl and create your own stick-ons, but I found alphabet stickers to be a quick and easy way to get the job done this time. That’s it! This project should take less than five minutes to complete, and it’s oh-so-cute and festive! You can find the little jingle bells in a variety of colors, so you can go with more traditional Christmas colors if you prefer. I love things like this that take so little time but look fun and fabulous when they’re finished. For more Holiday-themed craft projects that take just fifteen minutes or less, be sure to check out Craft Lightning at 15 Minute Crafts and The Country Chic Cottage. What a cute and easy idea!!! Love it!! This is so cute….I LOVE Craft Lightning! By any chance, do you remember where you found these cute jingle bells? I want to do this craft with about 100 kids from my church. Thanks! Where did you find the alphabet stickers?